Best estimates point to the practice of traditional wrapping resulting annually in the equivalent of 227,000 miles of wrapping paper, 4,500 tons of foil, and 125,000 tons of plastic. A lot of gift wrap isn’t recyclable because the paper has been treated or isn’t even paper. If you’re buying regular wrapping paper, get the kind with gridlines on the back. Cut carefully and use only what you need. Wrap the big gifts first and you’ll have little pieces left over for the smaller gifts. For tape, you probably need less than you think. It is totally possible to use only 3 - 4 pieces of tape to secure a square or rectangle package. Instead of petroleum-based ribbons and bows, use natural raffia, cotton twine, and yarn - or mix them all up for texture. Add real sprigs of greenery, colorful crimped paper shreds, and try different knots to create interesting bows that reflect your style. Use the really small leftover bits of wrapping paper to make your own tags. By far, some of the best ways to reduce are by reusing and recycling. Wrap your gifts in reusable cloth! Get creative and use something your recipient will love and reuse or that compliments the gift. Fancy dishcloths for the chef in your life, decorative tapestries and scarves, or even just beautiful remnants of fabric for a creative person make the wrap part of the gift. Thinner cloth works best for this. Present the gift in a reusable basket, bin, or container. The ideas here are endless and again, make the wrap part of the gift. Make a game of reusing last year’s gift bags and boxes. We have a shirt box in our family that’s older than some of the kids. It’s always funny seeing who gets a gift in the box this year. Brown paper grocery bags are made of sturdy kraft paper (that’s pricey when you buy it new). If you have some around, cut the bottom out, flip them inside out, and you have classy, unbleached paper for giftwrap. 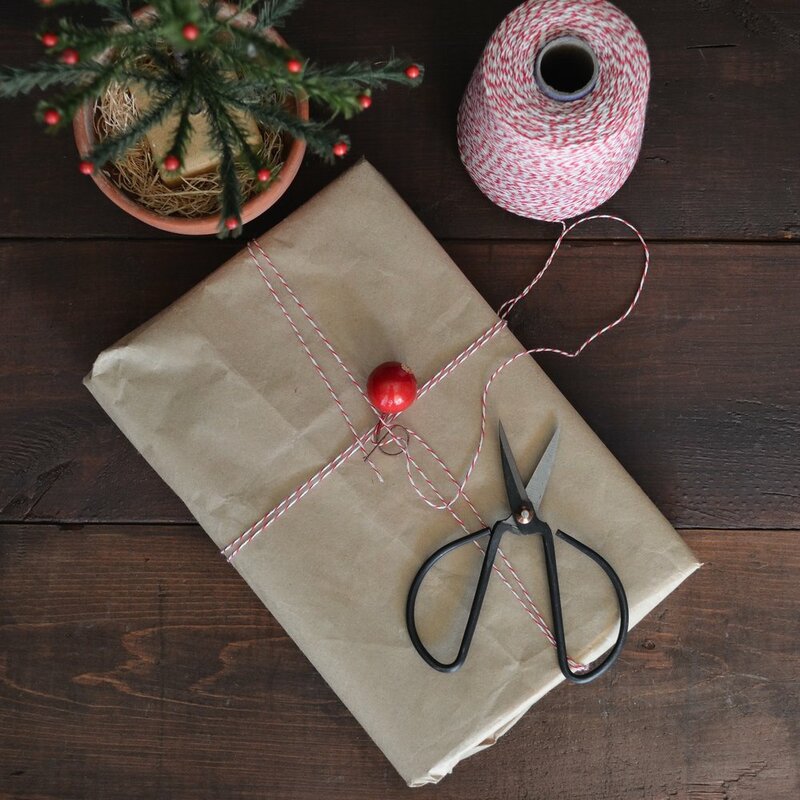 Save the plain white paper that comes as packaging when you order online and make your own beautiful wrapping paper by stamping a pattern on it. This is going to be priceless when your career as an artist takes off. Unique newspapers, books, and old maps can be really fun wrap. Papers in other languages from your travels, big map pages torn from old almanacs, or a quirky book’s pages make for a delightfully different presentation. Thrift stores are a good place to find old books and maps (and these pages are recyclable). Save all the regular bows that come to the party on other people’s gifts and reuse them next year. These literally last for years. Being generous and creative and kind with those you love at the holidays is a beautiful thing. And you can absolutely be good to the planet then, too. Warmest wishes and happy holidays, whatever your traditions.